As we treaded the ancient alleyways of Aleppo, Syria's second largest city, I thought that I had travelled back to the medieval world. The labyrinth of stone- roofed souks have not changed for hundred of years. Consisting of over 12 km (8 mi) of vaulted arches and subterranean passageways that remind travellers of Roman catacombs, they wind in every direction. Built by Al-Malik az-Zaher, Saladin's son, whose tomb is located at the entrance of the souk opposite the famed Aleppo Citadel, every one of these narrow thoroughfares is considered to be a living museum of past ages. As in the past, this largest bazaar in the Middle East, called the Great Bazaar and made up of thirty interlinked markets and khans, is a medieval wonder. It hums with activity - mostly Syrians shoppers, but with an ever-increasing number of tourists. A great number of the people of Aleppo and the surrounding countryside, especially labourers and peasants do their daily purchasing in this maze of covered streets. For the inhabitants, they are a daily market place, but for visitors, an exotic experience of shopping in the aura of the middle ages. The epitome of eastern bazaars, this network of covered souks, which have not fundamentally changed since the 12th century, is the most striking in any Islamic city. Teeming with activity and dramatically lighted up by shafts of light arrowing down from the high vaulted roofs, these medieval market places are genuine. Artisan goods, brushes, clothing, fabrics, foods, leather and wooden articles, perfumes, ropes, threads, spices and the products of the 20th century are displayed against the thick stone passageways. As in medieval times, every type of merchandise has its place. From souk to souk, the world of exhibited wares changes. In one section are stalls piled high with balls of strings and thread, sparkling with all the colours of the rainbow. Next door, handmade brushes and brooms hang from walls like large tree-leaves, and baskets, in all shapes and sizes, are attached to ceilings like colourfully painted lamp shades. Beyond, bales of fabrics displayed in dome-like stalls are an open invitation to attractive Bedouin women and chic city ladies alike. They vie with each other in crumpling the cloth with their hands - testing its texture in the traditional oriental method. After endless haggling, figures are agreed upon and both buyer and vendor feel content. Rare is a person who leaves without making a purchase. Dotted among the shops and, in places, edging each other, leather craftsmen, rope-makers and metal workers ply their trades. Some transform great sheets of brass, copper or iron into pans, pots and endless other products. Some distance away, men convert gold and silver into exquisite jewellery. For tourists, the handiwork of these craftsmen, the art of which has been, for hundreds of years, handed down from father to son, is a world of oriental splendour. We watched these artisans for a while, then left to enter the winter-like wonderland of raw cotton and combed wool, piled in bales of dazzling white. The young men beating the wool with long thin whips appeared to produce falls of fluffy snow in the cobbled souks. In sharp contrast to this activity, were the men carrying sheep carcasses on their shoulders through the odour of the meat stalls. As we passed, men stripping the meat from heads of sheep smiled when they saw us watching their agile hands at work. Every once and a while we would have to move quickly when wheelbarrows piled with goods came up behind us. At other times, porters carrying heavy loads would push us into the open doorways of the shops. As we moved along we became confused by the merchants greetings of bonjour, hello, ola, ciao and gutentag, seemingly missing out on the Arabic salamu alaykum, in their attempts to make the visitors feel at home. All activity seemed to fit into this medieval scene in this ancient marketplace that has found the secret of eternal life. I was thinking of these pedestrian-irritating vehicles when, as we turned a corner, a multitude of enticing perfume smells assailed us. Allspice, aniseed, coriander, cumin, nutmeg, peppercorn and dried henna, used to decorate the palms of women, were attractively piled on the ground, atop tables and on trays. Their aromas intoxicated us and we seemed to move in a world of make-believe. Passing a merchant who was snoring while he inhaled the aromatic fragrance of his spices, I remarked to my daughter, "This must have been how the Arabian Nights were conceived." When we lost interest in the souks' countless products, we moved on to examine the old hammams (baths) and two-story khans (caravanserais) where in the bygone ages merchants with their goods, horses and camels were lodged. They were entered from the souks through fortified doorways, leading into grand courtyards where the animals were tethered amid sacks and bales of merchandise. The surrounding ground floors were utilized as stables and for warehousing goods while the top stories were used as living quarters. All these old inns had huge wooden doors, decorated facades and high-arched entrances and some were very famous - known by travellers as far-away as China. Some of these still-standing khans are Khan al-Wazeer, Khan al-Saboon, Khan al- Gumrok (Custom's Caravanserai) and Khan al-Nahaseen (Coppersmith Caravanserai ). Khan al-Gumrok, which dates from the 17th century, was the headquarters of the British Company of the Levant and, at one time housed the British, Dutch and French consulates. Today, its ground floor is crammed with shops and the top story is utilized as living quarters. Khan al-Nahaseen, in the heart of the Great Bazaar, dates from the 15th century and is the oldest continuously inhabited building in Aleppo. It once housed the Venetian consulate and later became known as the house of Monsieur Poche - for many years the Belgium Consul in Aleppo. Today, the khan, which overshadows Hammam en-Nahaseen - the oldest public bath in the city - is used for various handicraft activities. After visiting these khans with their adjoining souks, it became apparent to us that we were seeing a dream-like picture from a long gone world - the past ages when Aleppo was the pivot of Middle Eastern commerce and one of the most important cities on earth. It is an image that one rarely encounters in this modern world. Sadly this is what Aleppo looks like now in 2018 after Assad and Putin have finished with it. You can still help the Red Cross help families there. IF YOU GO - *This info below somewhat now redundant. But worth reading to see what is lost. 1) All foreigners entering Syria require a visa, which is best obtained from an embassy or consulate outside of Syria. Visas are valid for 15 days, but can be extended once inside the country. 3) Despite being depicted in some of the Western media as a land full of terrorists, Syria is very safe for travellers - one of the safest countries in the world. Even women travelling alone find few problems. 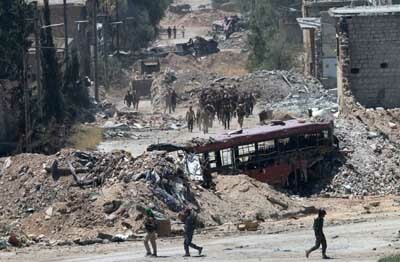 Urban crime, which plagues most modern cities, is virtually non-existent in Syria. 4) City transportation in Aleppo is efficient - taxis are metered and dirt-cheap. 5) For foreigners, all hotel bills must be paid in U.S. dollars - much more expensive than that charged for Syrians and Lebanese who can pay in Syrian liras. 6) Aleppo is the gourmet capital of the Middle East. The city's food is varied and usually very tasty and reasonably priced. One of the top places to eat is Beit Wakil Hotel - Restaurant, Jdeidah Plaza, Al Hatab Square. Tel: 221-7169/2247063. Amid Arabic decor one can dine on the best of Aleppo food. Al Challal Restaurant, Al Azizieh, Tel: 2243344  cost of meal $5. Hogop Restaurant, a peoples eating-place offering the finest kabab in Aleppo since 1961 - costs about $3. However, for the mother of all meals, a buffet in the Chahba Cham Palace on Friday and Saturday should not be missed. It includes the top foods in the Middle East - cost about $20. 7) Internet cafes are found in all the major cities in Syria. Many use DSL and are very up-to-date. In luxury hotels the price is from $6. to $7. ; in regular cafes from $1. to $2. In addition, there are a series of budget hotels in Aleppo like the run-down but renowned Baron Hotel where a double room, including breakfast, costs about $40. per day.